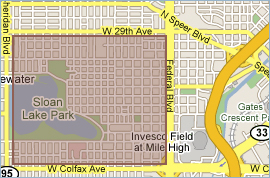 The Sloans Lake neighborhood is located just to the south of the Highlands neighborhood and west of the city center in an area identified as Denver North West. Hugging its namesake park, the Sloans Lake neighborhood is a taste of lakefront living nestled at the foot of the Rocky Mountains. Just west of downtown, it’s bordered east-west by Sheridan and Federal Boulevard, and, north-south by 29th and 17th Avenue. Although similar to many Denver neighborhoods, what make Sloans Lake Denver homes unique is the 177-acre lake occupying the south-east corner, as well as the wide streets and well-spaced, full-grown trees. And on A small aesthetic note, big sunrooms are popular around the park, which perfectly defines the sunny, open, lake-front vibe of the overall community.